This is great single-column AV component system that mounts directly under wall-mounted TVs for a sleek, streamlined look. Its thick tempered glass can hold up to 8kg/17.6lbs of DVD players or most any other AV components. The tempered glass shelf to be installed on the shelf holder can be vertically adjusted along the aluminum wall plate to accommodate any AV component arrangement. The center column features two integrated channels for easy power cable and signal wire routing. This bracket has two shelves. Simply mount this wall mount shelf system under your TV. This item comes with two durable tempered glass shelves that can hold up to 17.6 lbs each. ☀ [DUAL SHELF DESIGN] -- Included 2 shelves are constructed out of tempered glass. The height of the shelves is adjustable. It provides an option to move shelves up and down depending on the unit's dimensions. Adjust any of your shelves for different components. Each shelf is 13.7in. x 9.6in. 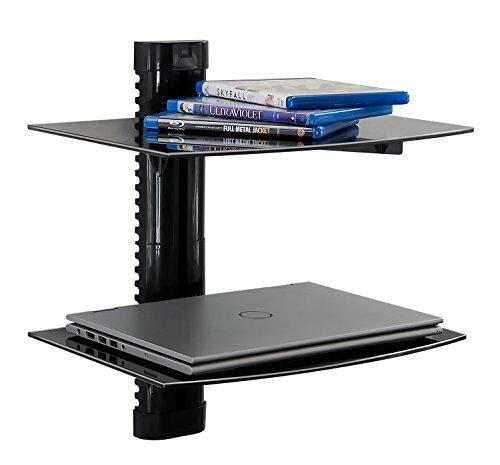 ☀ [COMPATIBILITY] -- The wall mount shelf is compatible with wood and concrete walls. Its smooth, slim profile seamlessly complements your wall mounted flat panel LED TV. And it will complement your wall mounted TV and help you achieve an uncluttered look with no need for large media stands or TV furniture.